A singularly fascinating 1747 map of Greenland, Iceland and the Faroe Islands by E. Bowen. 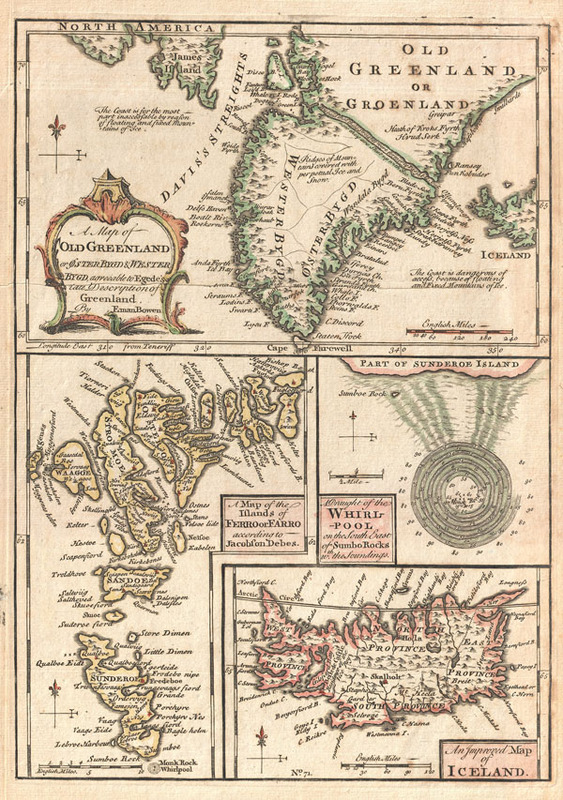 Essentially four maps on one sheet, this map of the North Atlantic islands is festooned with speculation and curiosities. The lower left map depicts the Faroe Islands. Today these stunning green islands are considered one of the most beautiful and unspoiled places on earth. Our map depicts the Faroe Islands according a map contained in a 17th century book on the islands written by Jacobson Debes. The Faroe Islands have been historically treacherous for mariners due to the unpredictable currents and tides surrounding them. One of the most curious and legendary results of these currents is the great maelstrom that once roared at the southern tip of Sunderoe (today Suouroy Island) - depicted on our map at the right center. This mighty whirlpool swirled around a sheer pinnacle of rock called Monek, which was said to resemble a monk from one side and a sailing ship from the other. Reports say that the whirlpool was over a mile in diameter. Soundings show that the waters surrounding the whirlpool had a depth of some 80 to 90 fathoms, but that the waters nearer the rock, at the center of the maelstrom, were but 7 to 10 fathoms deep. Sadly this startling natural phenomenon is no more. In 1884 much of Monek Rock crumbled into the sea, creating a dangerous underwater reef and displacing the unique convergence that created the maelstrom. In the lower right hand corner of our chart is a map of Iceland. Iceland had been fairly well mapped since the late 16th century. This map, updated from earlier maps, shows the royal residence and four primary provinces. Bowen, E., A complete system of geography. Being a description of all the countries, islands, cities, chief towns, harbours, lakes, and rivers, mountains, mines, &c. of the known world …, 1747 edition. Very good conditon. Mild overall toning. Old crease through southern Greenland. Blank on verso. Rumsey 3733.070. Phillips (Atlases) 614. Phillips (Maps of America), p. 303. National Maritime Museum, p. 356.